Get off on the Overtoom at the stop: J. P. Heijestraat. If you use the tram from the Leidseplein, you have to walk 200 metres further on the Overtoom and you will find restaurant Addis Ababa on your left side right next to car rental company Hertz. 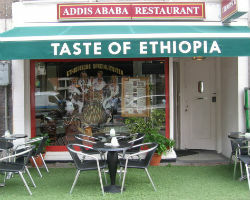 If you are coming by tram from the Amstelveenseweg, restaurant Addis Ababa is situated on your right side right next to car rental company Hertz. In this case, you must walk 200 metres back on the Overtoom.